When I asked him why he wanted to have school lunch?! He said that he like tacos & Quesadilla which their friends have at school. 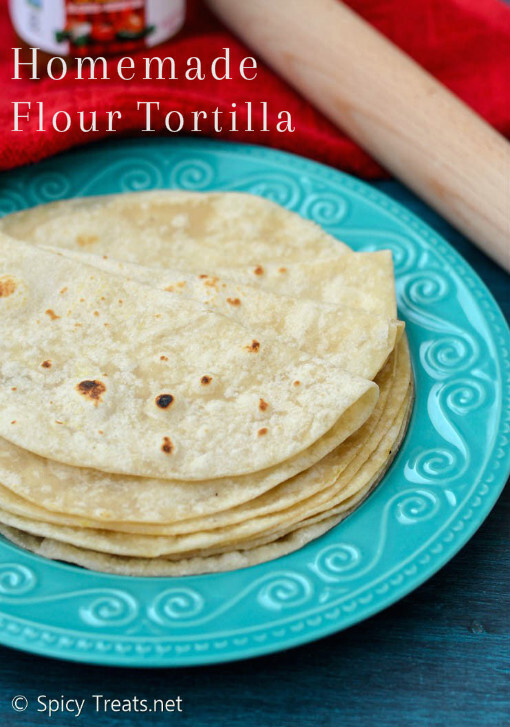 So mainly, for him I tried this Flour Tortillas at home, So that I can prepare Quesadilla & Soft flour Tacos at home itself with all fresh ingredients. The flour tortillas turned out super soft even without lard or shortening. I used both white and wheat flour combo. Some tortillas even puffed up like big phulka on tawa itself. 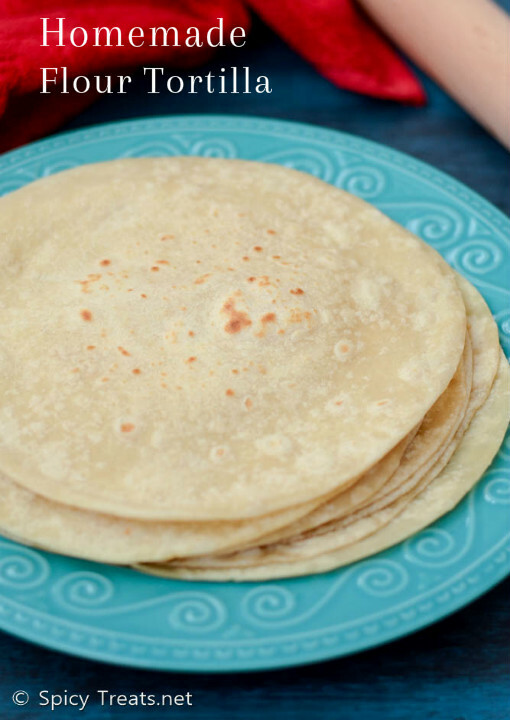 I made grilled cheesy quesadilla for my kids using homemade tortillas and they loved it a lot. Do give it a try as it is very simple and easy to prepare at home. Combine flour, salt and baking powder in a Mixing bowl. Mix dry ingredients until well combined. Now on a well floured surface, shape the dough into a smooth round ball and divide into 14 equal portions. Form each piece into a ball and flatten with the palm of your hand as much as possible. If dough is sticky, use a bit more flour. Cover flattened balls of dough with a clean kitchen towel and allow to rest for 15-20 minutes before proceeding. After rest period, heat a large pan over medium-high heat. Roll each dough piece into a rough circle, about 7-8 inches in diameter, keep work surface and rolling pin lightly floured. When pan is very hot, place a rolled disc into pan and allow to cook about 1 minute or until bottom surface has a few pale brown spots. The uncooked surface will begin to show a few little bubbles. If tortilla is browning too fast, reduced heat a bit. If it’s taking longer than a minute to see a few pale golden brown spots on underside of tortillas, increase heat a bit. Flip to other side and cook for about 30 seconds. You want the tortilla to be soft but have a few small pale golden brown spots on surface. Remove from pan with tongs and stack in a covered container till all tortillas are cooked. This will keep them soft and pliable. Serve warm or allow to cool for later use. 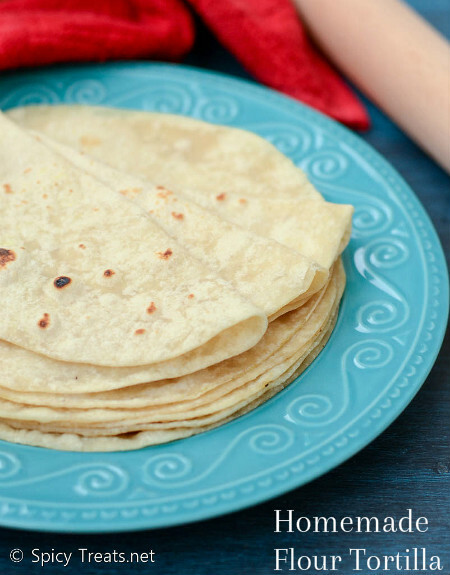 You can make this tortillas using White Flour Alone or Wheat Flour alone. Water quantity depends on the quality of flour. It using whole grain flour then it requires bit extra water. So add accordingly. Make sure the dough is soft and pliable. If using the cooked tortillas for later hours, simply microwave the tortillas for 25-30 seconds and use it.